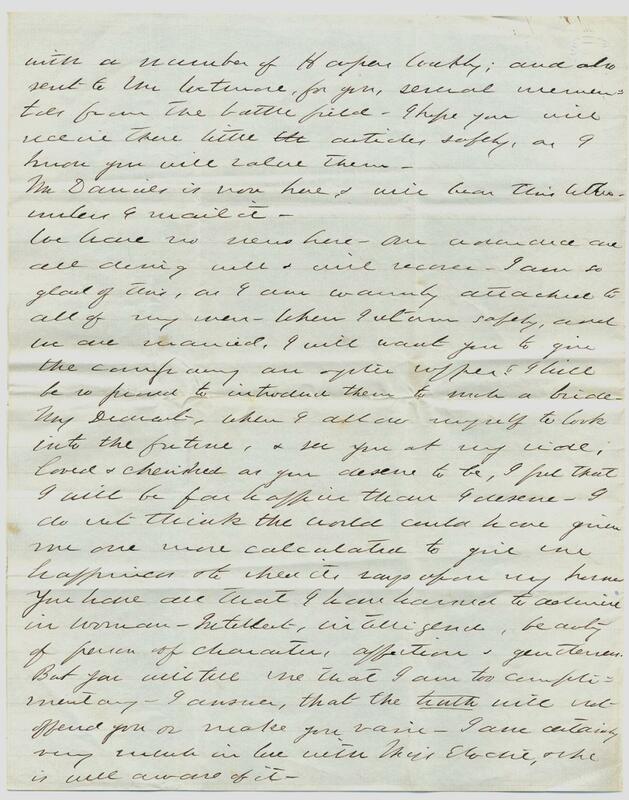 Item description: Letter from Nathaniel Henry Rhodes Dawson (1829-1895) to his fiancee Elodie Todd (1844-1881). Nathaniel Henry Rhodes Dawson was a Selma, Ala., lawyer and politician, Confederate officer in the 4th Alabama Infantry Regiment, and United States commissioner of education. Elodie Todd was the sister of Mary Todd Lincoln, the wife of Abraham Lincoln. 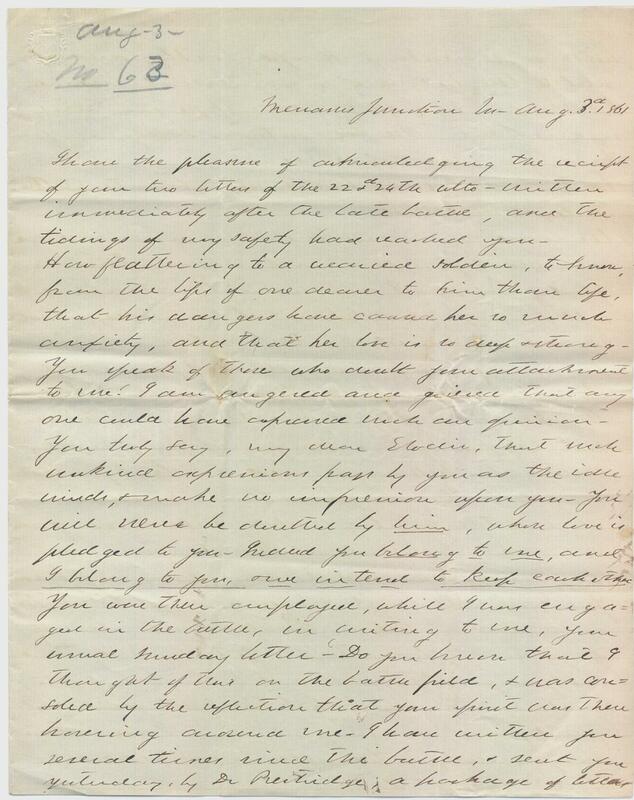 During the Civil War, Dawson and Todd exchanged letters almost daily. They later married. 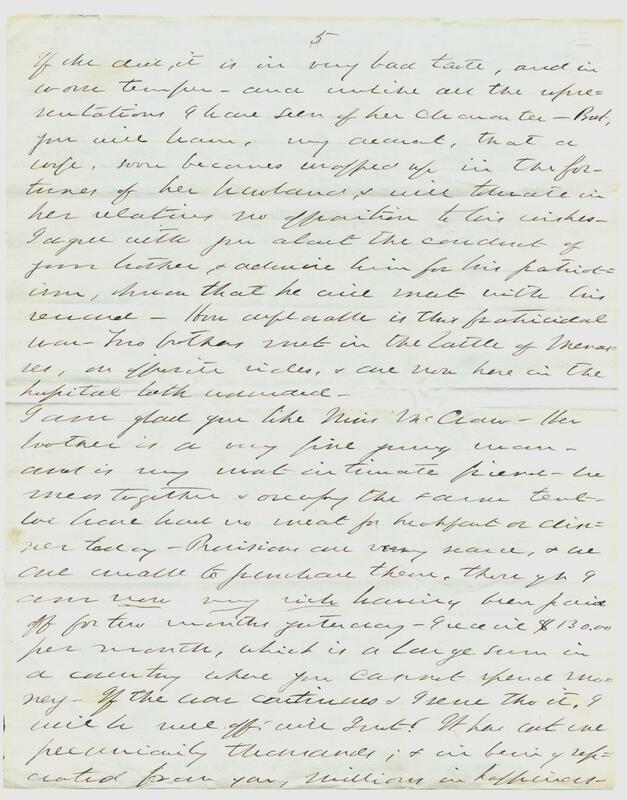 In this letter, dated 3 August 1861, Dawson expresses his devotion to Todd, discusses matters on the home front in Alabama, mentions possible relocation of his regiment to northwestern Virginia (West Virginia), and comments on the aftermath of the Battle of First Bull Run (First Manassas) and other subjects. Item citation: From folder 17 of the Nathaniel Henry Rhodes Dawson Papers, #210, Southern Historical Collection, The Wilson Library, University of North Carolina at Chapel Hill. I have the pleasure of acknowledging the receipt of your two letters of the 22d and 24th ulto. written immediately after the late battle, and the tidings of my safety had reached you. How flattering to a wearied soldier, to know, from the lips of one dearer to him than life, that his dangers have caused her so much anxiety, and that her love is so deep and strong. You speak of those who doubt your attachment to me. I am angered and grieved that any one could have expressed such an opinion. You truly say, my dear Elodie, that such unkind expression pass by you as the idle wind, and make no impression upon you. You will never be doubted by him, whose love is pledged to you. Indeed you belong to me, and I belong to you, and we intend to keep each other. You were thus employed, while I was engaged in the battle, in writing to me, your usual Sunday letter. Do you know that I thought of this on the battle field, and was consoled by the reflection that your spirit was there hovering around me. 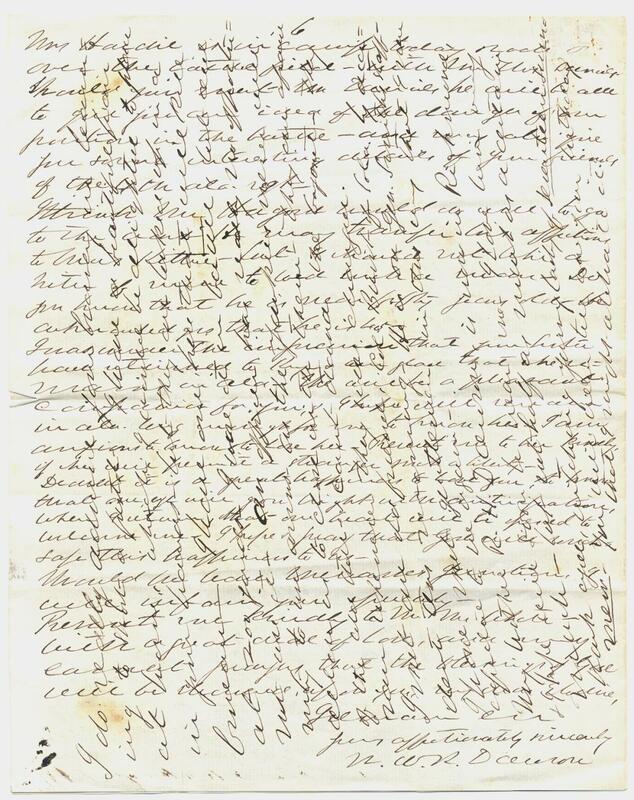 I have written you several times since the battle, and sent you yesterday , by Dr. Prestridge, a package of letters with a number of Harpers Weekly, and also sent to Mr. Wetmore, for you, several mementoes from the battle field. I hope you will receive the little articles safely, as I know you will value them. 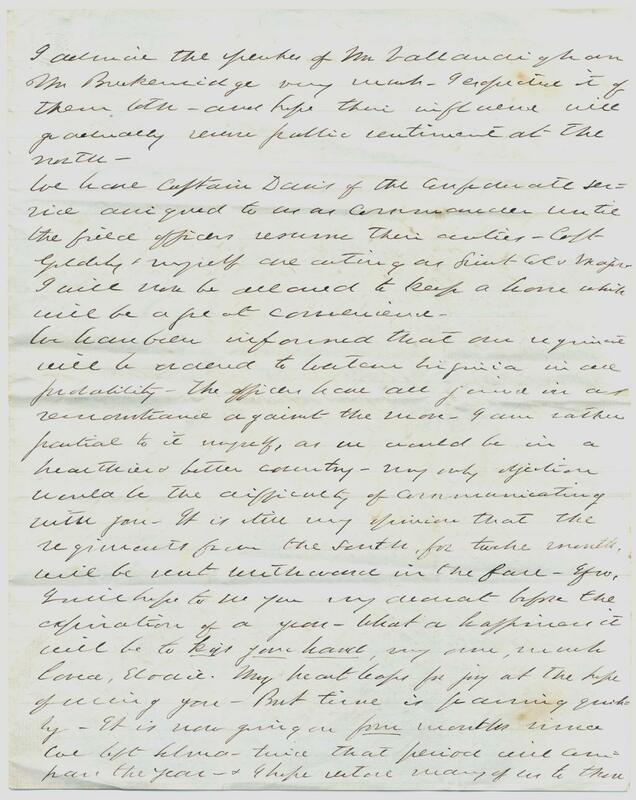 Mr. Daniels is now here, and will bear this letter, unless I mail it. We have no news here. Our wounded are still doing well and will recover. I am so glad of this, as I am warmly attached to all of my men. When I return safely, and we are married, I will want you to give the company an oyster supper and I will be so proud to introduce them to such a bride. My Dearest, when I allow myself to look into the future, and see you at my side, loved and cherished as you deserve to be, I feel that I will be far happier than I deserve. I do not think the world could have given me one more calculated to give me happiness and to shed its rays upon my home. You have all that I have learned to admire in woman. Intellect, intelligence, beauty of person in character, affection and gentleness. But you will tell me that I am too complimentary. I answer, that the truth will not offend you or make you vain. I am certainly very much in love with Miss Elodie, and she is well aware of it. I admire the speeches of Mr. Vallangdigham and Mr. Breckenridge very much. I expected it of them both, and hope their influence will gradually reverse public sentiment at the north. We have Captain Davis of the Confederate service assigned to us as commander until the field officers resume their duties. Capt. Goldby and myself are acting as Lieut Col and Major. I will now be allowed to keep a horse which will be a great convenience. We have been informed that our regiment will be ordered to western Virgina in all probability. The officers have all joined in a remonstrance against the move. I am rather partial to it myself, as we would be in a healthier and better country. My only objection would be the difficulty of communicating with you. It is still my opinion that the regiments from the south for twelve months, will be sent southward in the fall. If so, I will hope to see you my dearest before the expiration of a year/ What a happiness it will be to kiss your hand, my own, much loved, Elodie. My heart leaps for joy at the hope of seeing you. But time is passing quickly. It is now going on four months since we left Selma, twice that period will compass the year. I hope to restore many of us to those whom we love so dearly. I thought the 19th of April was the day upon which we were engaged, but my mind was so much confused about dates, at the time of our departure, that I wished to know from you whether I was correct. You ask me to find out some poor fellow, in my company, who has neither mother nor sister to care especially for him, and you will attend to his wants in knitting and sewing. I will do so most cheerfully, and hope you will proceed at once with your knitting. I will even name myself, as the man, and hope you will be so good as to keep your promise. I will be very happy to receive a specimen of your needles and will agree with you that you will make a nice looking old lady, provided you do as I desire. I have neither mother or sister who care specially for me. If you will place the ambrotype in Mr. Wetmore’s hands he will have it sent to Cahalo to Lizzie. I send you a letter received from her today. 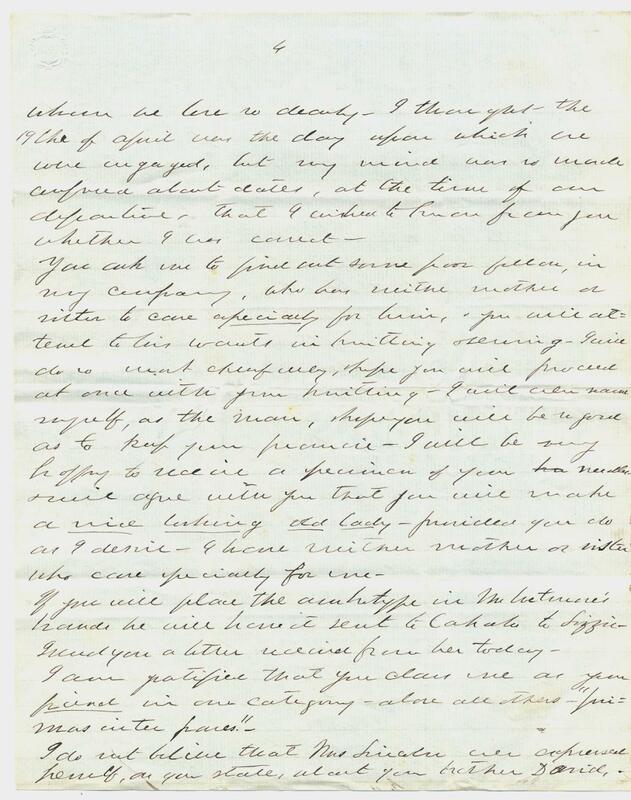 I do not believe that Mrs. Lincoln ever expressed herself, as you state, about your brother David. If she did, it is in very bad taste, and in worse temper, and unlike all the representations I have seen of her character. But, you will learn, my dearest, that a wife, soon becomes wrapped up in the fortunes of her husband, and will tolerate in her relatives no opposition to his wishes. I agree with you about the conduct of your brother, and admire him for his patriotism, and know that he will meet with his reward. How deplorable is this fratricidal war. Two brothers met in the battle of Manassas, on opposite sides, and are now here in the hospital both wounded. I am glad you like Miss McGraw. Her brother is a very fine young man, and is my most intimate friend. We mess together and occupy the same tent. We have had no meat for breakfast or dinner today. Provisions are very scarce,and we are unable to purchase them, though I am now very rich having been paid off for two months yesterday. I receive $130.00 per month, which is a large sum in a country where you cannot spend money. If the war continues and I save tho it, I will be well off, will I not? It has cut me pecuniarily thousands, and is being separated from you, millions in happiness. Mrs. Hardie is in camp today and rode over the battlefield, with Mr. Thos. Daniels. Should you visit Mr. Daniels he will be able to give you an idea of the danger of our position in the battle, and may also giveyou some interesting details of you friends of the 4th Ala. rgt. I think Mr. Hagood would do well to go to the war. He may transfer his affection to Miss Kittie, but I should not like a sister of mine to wed such a man. Do you know that he is near fifty years old. He acknowledges that he is forty five. I was under the impression that your sister had returned to Ky. and am glad that she remains in Ala. She will be a pleasant companion for you, and I hope will remain in Ala. long enough for me to know her. I am anxious to know and to love her. Present me to her kindly, if she will permit a stranger such a liberty. Dearest it is a great happiness to love you, and to know that one eye will grow bright with anticipation, when I return, that one heart will be opened to welcome me. I hope and pray that God will vouchsafe this happiness to us. Should we leave Manassas Junction, I will inform you speedily. Present me kindly to Mr. and Mrs. White. With a great deal of love and my earnest prayers that the blessings of God will be showered upon you, My dear Elodie. I do really admire your bravery in learning to shoot a pistol. I have a beautiful pair at home, which I would be delighted to place in your hands, but they are locked up in a bureau. I have one here that will kill at 200 yards. I wore it in a battle but did not use it. An officer has really no opportunity to use arms as the Yankees never will allow us to close with them. They are afraid of the cold steel and can’t stand the bayonet. They ran whenever they were charged. I met an old friend, Col. Burt of So Ca. by accident this morning. He is on Gen. Smith’s staff. I have met gentlemen in this way that I never expected to see again. My brother R.H. Dawson is now in Richmond, and I hope will soon be near me. I love him very much, but not half as much as a certain black eyed, witching young lady of seventeen summers. You will never tell on your birthday that I might celebrate it. This entry was posted in Southern Historical Collection and tagged Alabama, Elodie Todd, First Battle of Bull Run, First Battle of Manassas, Mary Todd Lincoln, Nathaniel Henry Rhodes Dawson, Selma. Bookmark the permalink. I was very interested in this site, my g.g.g.g.uncle being Capt. John Cussons, VADC to Gen. Law. I believe that there was some issue tainting Captain N H R Dawson’s actions during 1st Manassas, in response to which members of his company, together with brother regimental officers, including my ancestor who was a leiut., at the time, spoke of his courage etc. Do you know what this issue was?